The cause of most problems or dissatisfaction is, in fact, the lack of knowledge and information on the subject. Whether it is the logic of the application or basic principles knowledge, in our case the meteorological science. Following answers to the most frequently asked questions will help you understand better the functioning and principles of application Meteoservis. What is Meteoservis different from other similar apps? Meteoservis is different weather app. It is the complete weather service with professional background designed specifically for Czech and Slovak Republic, build by a team of developers with experiences with meteorology. Unlike most similar applications, Meteoservis doesn’t draw forecast data from other servers or meteo-sites, but he directly interprets the outputs of numerical models. It’s based on the detailed weather forecast in three-hours intervals, so you always have a complete overview of how the weather will change in the course of the day or night. Meteoservis will fully appreciate amateur weather forecasters and other enthusiasts and fans of weather monitoring. But even ordinary user will find here verbal forecast and an 5-days overview of the weather. Advanced users can make use of other information about the weather or the detailed forecast and soon also the tools for the analysis of weather forecasts. Why sometimes the app shows a different temperature or the weather than reality is? The reasons are several. The main and absolutely essential is the fact that Meteoservis does not display the current temperature but it is always about the forecast for the given period of time. The only “place” where you can obtain information about the current temperature is section “Current weather”, where you can view a map of the current temperatures in the Czech and Slovak Republic. Therefore is clear that often the measured data (Meteoservis, as already stated, does not display) may differ from those predicted, for example if there is the temperature inversion. And that’s the second reason. The occurence of the low cloud inverse cannot be reliably predicted. This is a local phenomenon, but which may significantly affect the temperature and so instead of + 5 °C, the temperature may remain below freezing. Another important factor is the measurement of the temperature. The thermometer or the station located in the town centre will of course have a higher temperature than outside the city. And the difference can be several degrees. For the same reason you cannot even rely on information from the amateur weather-station, whose data are available on the Internet. 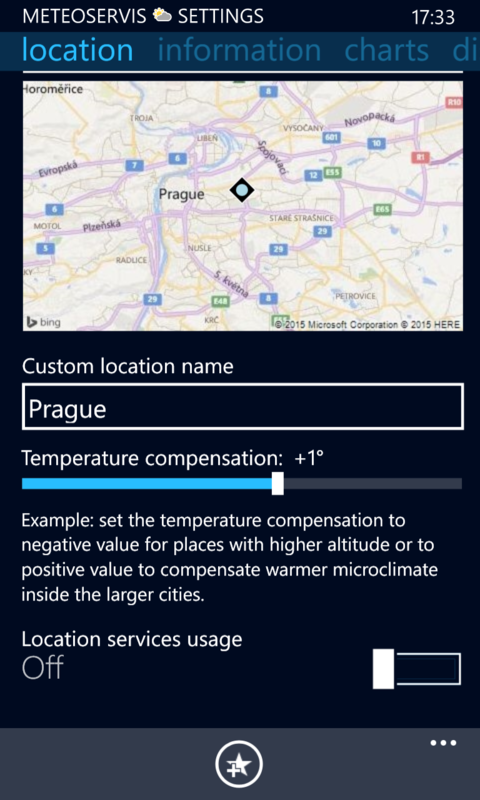 To compensate for the warmer microclimate inside the larger cities (or vice versa for places with higher altitude) a temperature compensation settings for a given location can be used in the application. And most of all, remember that it is still just the weather forecast and the application cannot affect the behavior of nature. Presented weather forecast is the output of numerical models which is not always 100% matching with reality. Is it possible to view current measured temperature for a given location? No, unfortunately. At least not in the current version. Meteoservis is primarily focused on the weather forecast and other information about the current weather are just complementary. The displayed map of temperatures is loaded and shown just as an image. For the view that, e.g. cooling is comming from the Northwest, it is quite sufficient, and this map shouldn’t supply detailed information about current, measured temperatures. Why, when to use, and how the temperature compensation works? As already mentioned above, station located in the town centre can have a higher temperature than outside of the city. And the difference can be several degrees. On the other side, places with higher altitude are generally colder than the temperature “declared”. All forecast numerical models in their calculation virtually ignores this fact and works with simplified orography. The resulting values are calculated for a given location (coordinates), but regardless, whether this is a residential area and or deep forest. These thermal anomalies in populated areas are not taken into account and the resulting predicted values doesn’t count with it. For example: predicted temperature +5°C may be measured somewhere outside the city, but inside the city will be +6 or even +7°C. By setting the temperature compensation to +1° for your site this shall be eliminated or at least suppressed and closer to the reality. However, the correct value must always be determined experimentally. The temperature compensation always refers only to the desired location and for each location can be set differently. How does the weather forecast and the calculation of the numeric model works? Unlike most similar applications, Meteoservis doesn’t draw data on forecasts from other meteo- or Web-sites, but it analyzes and interprets numerical model outputs directly. The numerical model is implemented for the different places in Czech Republic and Slovakia. These locations (defined by GPS coordinates) are called reference points. For them, numeric model calculation is performed or interpolated. Completely symmetrical and detailed coverage of the territory of the Czech and Slovak Republic and later all over Europe will come in the near future. Virtually every numerical model works with a specific forecast resolution, which is the most 0,5 degree (latitude and longitude) which roughly means a square measuring 35 x 62 km. Greater resolution is neither necessary for normal use. Meteoservis always selects the best (closest) reference point for the place you selected. This assignment is done automatically, therefore, no need to worry. What the icons and other information mean? Graphical interface and information presentation was designed to be fast and obvious at first glance what that information represents, what it means, etc. However, some elements or icons need further explanation. The figure on the right shows the description of the lesser-known data and their icons. Icon ‘figure’ presents an information about the felt temperature (so called Windchill or heat-index in the summer). It’s calculated relative value indicating what temperature your body perceives subjectively, depending on the strength of flow (wind) or depending on the sunlight (for the Heat-Index). Icon ‘heart’ presents an information about the atmospheric pressure reduced to sea level. Finally, a few information about the “Forecast overview” section. In the upper part you will find (average) weather icon forecast for each day, including the maximum daily temperature. Below are icons representing the (average) weather at night, including minimum night or early morning temperatures. The graphs below show the evolution of the daily maximum and minimum temperatures for those days/nights. The bar graph shows the complete temperature changes over this period. On other charts you can see pressure development and also an overview of precipitation consolidated to 5 mm/3hod. All these data represent a summary report for the relevant period and relate to the days/nights listed above. Is geolocation and automatic detection of my position supported? Yes. Available is automatic detection of your position when the application itself detects the place/city, which is closest to your current location, and automatically selects this place for you. Just tap on the “cross hair” (on right, next to buttons for the State/City selection) and your current position will automatically be detected and the nearest place from the list is selected. But you also can make use of automatic city selection for the forecast according to your current position (dynamic location), so the application itself selects the closest reference point/city based on your current location. To activate this feature select ‘Automatically’ from the country selection box in the Settings(Location) page. Temperature compensation (for each location) will be retained even in this mode. Also, in the detailed view of the CZ and SK radar images, you can see your current position on the map to quickly identify your current location. You can also ask your question in the application forum. Likewise, use this discussion forum if you have an idea for application improvements etc. Write your comments and error description with a maximum of details. Before you ask a question or report the problem or malfunction in the application, read carefully system requirements and manual for the application.